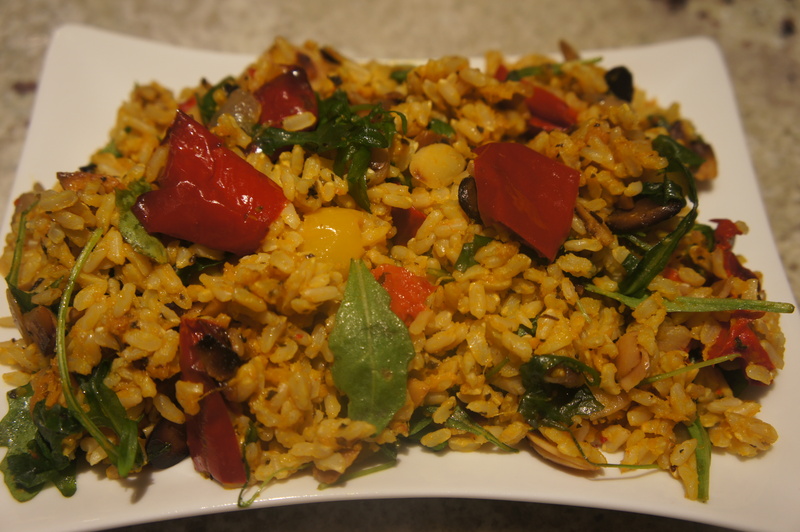 BROWN RICE SALAD FOR THOSE WHO HATE RICE SALADS WITH A PASSION UNEQUALLED IN THIS WORLD. I hate rice salads. His Nibs loves rice salads. I hate brown rice in particular. His Nibs loves rice, especially brown rice. His Nibs hates pumpkin, capsicum and rocket lettuce. I, of course, love all three. We’ve been together forty years – it’s a miracle really! For the past decade or so I have experimented with every conceivable kind of rice salad recipe. This is a mish mash of so many different recipe combinations I’ve lost track. This recipe works for us. It is a modern miracle approaching biblical significance. You can eat it cold, room temperature or heated. It is one of the best comfort foods. Like ‘THE SALAD FOR THOSE WHO HATE SALADS’, this RICE SALAD flies off the plate when we entertain. Friends have requested this recipe for some months now. I apologise for the delay. The weather now lends itself for this dish, although I eat it heated up during winter as a comfort food. Chop your capsicums and pumpkin into small bight size pieces. Put them into a baking dish with olive oil. Swish them around to make sure the vegetables are well coated with oil, and then sprinkle them with a healthy large pinch of dried basil. (Dried basil works better in this dish, for some mysterious reason, than the herbs I grow. They’re stronger and more aromatic). Season with pepper and salt. Put them in the oven at whatever is the right temperature for your type of oven. Mine is fan forced so it’s 170C. Do them to your personal preference. I like my capsicums well roasted; my pumpkin I pull out early because I want it to disintegrate and become so mushy it coats the rice. I bake the pumpkin because it tastes better when baked rather than boiled or steamed, and I want that sweet roast pumpkin flavour. Boil the crap out of the brown rice. Follow the instructions on the pack. If you do the fast boil method, then it’ll take 20-25 minutes. Take a healthy handful of rocket . Combine all ingredients in a bowl. The rocket will wilt, which is what it is supposed to do, so don’t panic. Stir ingredients through. You don’t need any dressing as the oil and the pumpkin coat the rice. MAGIC! You must taste test the dish at this stage to make sure it is as you want it to be. Be warned, however, your other half may deem this his right, and there will be a struggle over the taste testing step in the process. Posted in Food, Politics, Sport, Kitchen, Recipes and tagged brown rice salad, Brown Rice Salad for those who hate rice salads, healthy comfort food, rice salad. Bookmark the permalink.